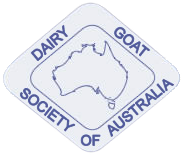 Welcome to the website of the Dairy Goat Society of Australia and thank you for your interest in Australian Dairy Goats. We currently have around 600 members across Australia and we welcome every new member. So many aspects of keeping dairy goats are filled with enjoyment. The sight of newly born kids, often twins or triplets is unequalled. While this only happens once a year, the daily interaction with your does during milking is also something special. So is feeding the kids on a bottle and when they respond to you when you call their name. At the same time, dairy goats are not for everyone. Dairy goats require daily attention and a commitment to their welfare. For example, when a doe is in milk, she must be milked at least once a day. They have to be fed with hay and provided with clean water every day. You will find that while they love routine, like being milked and fed at the same time each day, dairy goats are also very forgiving when things don’t go as planned. You will find that they will want your company as much as you will like being around them. They can be very affectionate. A group of young kids playing on a log or a mound of dirt can be the greatest time-waster known to a goat breeder. While there is much to learn about dairy goats, you will find that it will be a fulfilling experience. You will find that our members will be very open to helping you. All you need to do is ask. Once you get started, I encourage you to consider showing your goats at your local shows. You will find that this is a very informative experience where you will learn a lot from others and at the same time interact with fellow members. I’m sure that in time you will form some wonderful friendships. I know I have and this is one of the most rewarding aspects of being a member of the Dairy Goat Society of Australia. Like those of us who have had dairy goats for some years, I hope that your experience with them is filled with enjoyment. If I can assist your participation in any way, please contact me.